Kia Ora from canada!! Throughout '09, my place of destination is Guelph, Ontario, Canada! and it is here where ill be known as a "Rotary Youth Exchange Student". Subject to avaliability to internet, i will be updting my blog as much as possible to give you all in insight of my life as an exchange stident. JEALOUS MUCH??????? haha ENJOY! Reflecting on this day, the 27th September, i can honestly say i went to the infamous Auckland Zoo for the first time in many years; only this time it was with a bunch of people i thought id never meet in my entire life; Rotary inbound students from Germany, Belguim, Sweden, France, and Finland. Too bad Denmark & Switzerland were not present with us on this fine day but beggers cant be choosers. This day was a chance for the Inbounders to explore one of Auckland's most exciting attractions, although Auckland isnt all that exciting to begin with. They all had the opportunity to expereience New Zealands wildlife, on show, as well as some more foriegn and exotic animals for example the Sumatran Tigers and the African Lions. I guess the weather wasn't too kind for us, but i can say from a personal point of view that i enjoyed everybody's company. 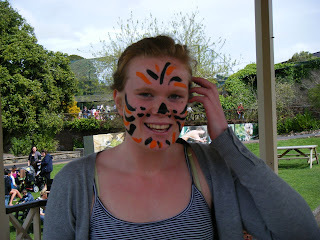 We all had some laughs; like some of us getting our faces painted (people, how old are we again??? ), and some dissapointments, like the world renound Kiwi wasn't witnessed in its own little enclosure thing. Sorry goes out to Sweden, France and Finland- its not my fault the Kiwi is shy. Overall, a sucessful day all around. 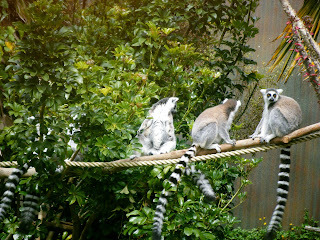 We were treated with Native and Exotic wildlife, Bad weather (that isn't soo good but owell), and eachothers company. Believe it or not, we hadn't seen eachother in about a month- gosh dosen't time fly?!?! I have attached some photos also. Hope these bring back some laughs which were plentiful and some memories. Enjoy team. Lucy; you aren't in year 2 any more! 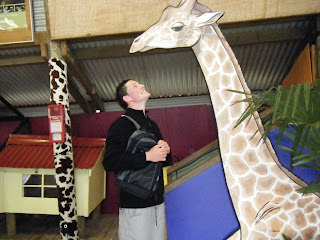 Everybody has height asperations- Dam those Giraffe things! You really do love me! I mean I even get my own umm special picture. Even If you do make me sound like an immature dork. Memememememe! What do you mean you cant remember what your house/home looks like??? Thats a terrible thing to say, I shall send you some photos immediately. Your mother.